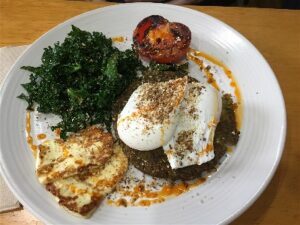 Foddies Cafe is one of my favourite cafes in Melbourne as both the gluten and non-gluten eaters get to really enjoy their meal! I am comfortable I am getting a safe gluten free meal and if you’re not gluten free you can still get ‘normal’ bread! Foddies’ mission is “to unite and bring people together through freedom of food choices”. All food is low FODMAP and the entire menu can be made gluten free by just using gluten free bread. Having friends that have issues with onion and garlic, they love being able to choose anything off the menu as these form the basis of so many dishes in mainstream restaurants. Most of the food is made on site, so they know exactly what is in the food so are also able to cater for other dietary issues. Foddies are becoming famous around Melbourne for their donuts. 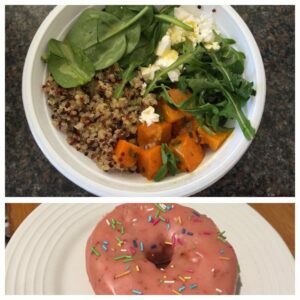 Lots of variety each day at both the Camberwell cafe and the Moonee Ponds Donut Shop. 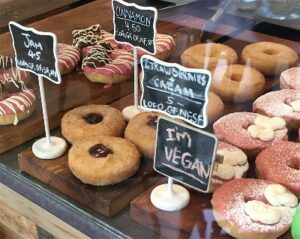 The donuts are all gluten free and many are also dairy free or vegan. I love a plain cinnamon donut, but there are many exotic flavours that have coeliacs swooning with joy! 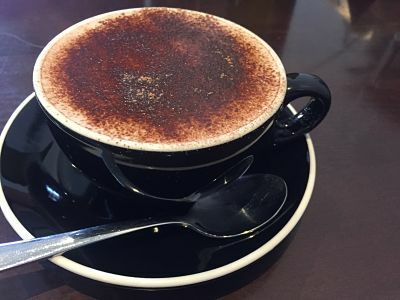 I always have a hot chocolate too, as I really miss just being able to have hot chocolate when out at other cafes (due to barley being in most mixes and gluten can also lurk in the chocolate sprinkled over the top!). The breakfast menu is available all day. 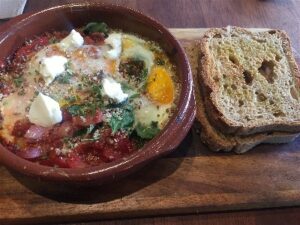 You will find a traditional fry up, a variety of egg options as well as pumpkin & zucchini (courgette) fritters and my favourite, the spanish baked egg with a hint of spice and your choice of bread. 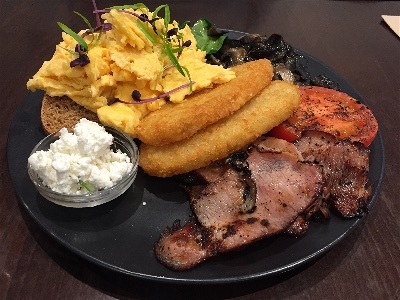 The fry up below is with non gluten free bread, which is what makes the cafe a favourite of ours, as my non coeliac husband doesn’t like gluten free bread! The dukkah eggs are a good vegetarian alternative. 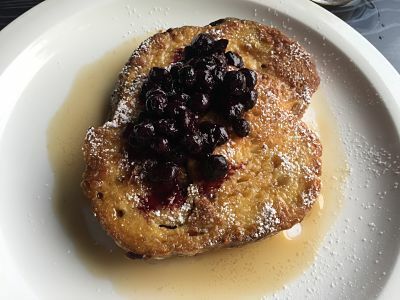 If you are after something sweet, try the French toast or waffles or even the pancake with nutella from the kids menu! Other meal options are burgers, salads or the small kids menu. 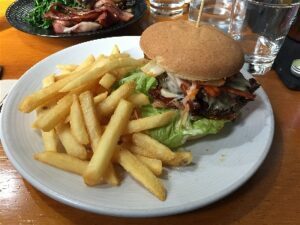 I still find having a burger while out a real treat and Foddies burgers are huge and you make a gooey mess when eating them. 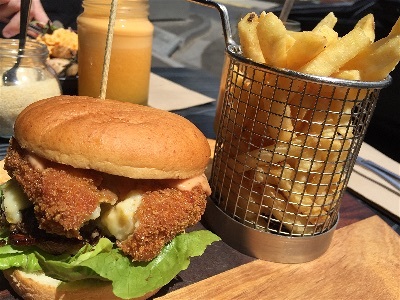 I find it hard to go past the pulled beef burger, but occasionally branch out and have a mac’n cheese or southern fried chicken burger. 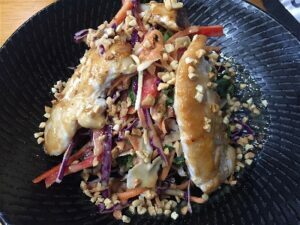 I absolutely love the Thai Chicken salad with the satay flavours and have had this many times. There are two other salads available, as well as a nourish bowl. I have had many meals at Foddie’s and have enjoyed all of them and so have my companions, whether gluten free or not. 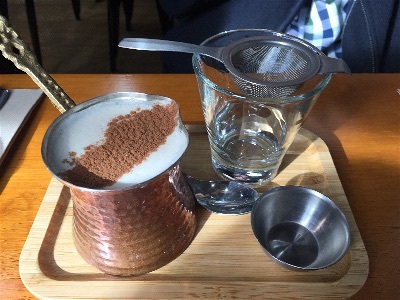 For the most up to date menu, please see their website (link at bottom of post) and go to ‘Locations’. There are also a limited number of items available to takeaway. There is some outside seating on Camberwell Road and in the small garden at the back of the shop, so in the sunny weather it is nice to be able to set outside with your dog. At the Camberwell store you are able to take away a small selection of meals, that are written up on the front window. You can of course also pop in just for a take away donut! You can order fresh low FODMAP meals to be delivered to your door or pick up a frozen meal at the cafe in Camberwell or at various health food stores around Melbourne. There are also sauces available, such as Bolognese sauce and tomato relish. Catering platters are also available, which I have used and everyone raved about the food and didn’t have a clue that it was gluten free and low FODMAP! Click here for more information. 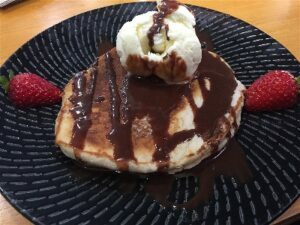 Foddies really have tried to think of everything to help those on special diets and are hoping to expand in the future, but in the meantime, support their Melbourne offerings! Moonee Ponds Donut Store & Albert Park cafe – These locations closed in 2018. Open Monday to Sunday, early until mid afternoon – check website for details. The kitchen closes 1/2 hour before closing time.